We’re delighted to be partnering with Ideal to host long time friend and supporter of all things Capsule, John Doran the editor of The Quietus. 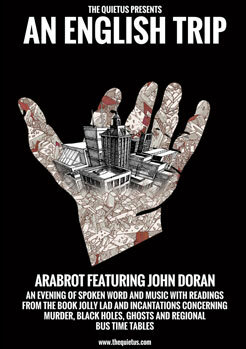 Doran is celebrating the publication of his first book – Jolly Lad – by going on a 31 date reading tour called An English Trip. He is teaming up with other writers, poets, film makers, musicians and DJs over the course of a month and putting on nights in prisons, churches, libraries, record shops, book stores, village halls, warehouses and cinemas and his musical support on every night of the tour is Kjetil Nernes aka Arabrot, the Norwegian noise rock musician. The night they have planned at Birmingham’s Eastside Projects is a real cracker. Anglo Trinidadian wordsmith Roger Robinson (King Midas Sound, Techno Animal, Attica Blues) is performing dub poetry from his new album Dis Side Ah Town (Jahtari Records). Twisted Leeds party starters Chrononautz are bringing the live techno vibes. John Doran is reading passages from Jolly Lad and also performing various incantations and rituals concerning black holes, the dismemberment of Dapper Laughs, ghosts and Birmingham bus timetables while backed ably by Kjetil Nernes from Arabrot.